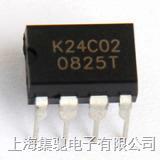 24C02 24C04 24C08 24C16 The 24LC04 is a 4K-bit serial read/write non-volatile memory device using the CMOS floating gate process. The HT24LC04 is a 4K-bit serial read/write non-volatile memory device using the CMOS floating gate process. Its 4096 bits of memory are organized into 512 words and each word is 8 bits. The device is optimized for use in many industrial and commercial applications where low power and low voltage operation are essential. Up to four HT24LC04 devices may be connected to the same two-wire bus. The HT24LC04 is guaranteed for 1M erase/write cycles and 40-year data retention. Write cycle time: 5ms max.